I've never felt this alone. Just to ease some of my own? And in all I am nowhere. with different sounds around us. crying in one another' s arms. and which try to escape. Give me just one last chance"
I want to cry, "It's not me, not me. These words are not my own"
Fishhooks pulling at my bleeding tongue. 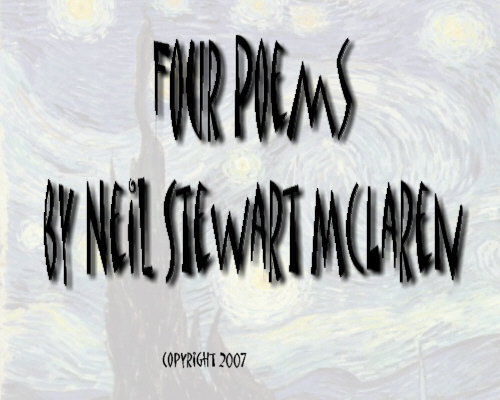 Copyright 2007, Neil Stewart McLaren. © This work is protected under the U.S. copyright laws. It may not be reproduced, reprinted, reused, or altered without the expressed written permission of the author. Neil Stewart McLaren graduated with a Bachelor's degree in English Literature and Politic Science from University of Strathclyde. He then trained and worked as a teacher and left the UK in 1993, to live and work in Slovakia, where he remained for five years, married and started a family. Since 1998 he has been living and working in Asia. He is a musician, playing guitar, bass, keyboards and vocals, and has performed professionally in the UK, Slovakia, Thailand, Singapore, Malaysia and Cambodia.